The Persus-se-Brand mountain bike trail is a great ride through the Knysna forest with exhilarating downhills, streams to refill your water and great scenery. 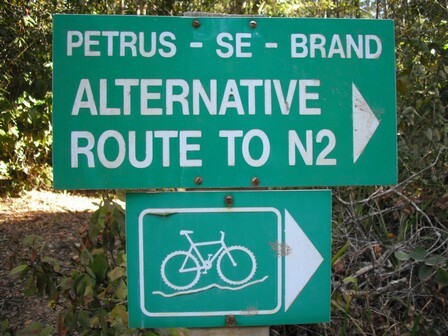 It is a one-way trail and can be done from either the Diepwalle Forest Station or Garden of Eden on the N2 between Knysna & Plettenberg Bay. 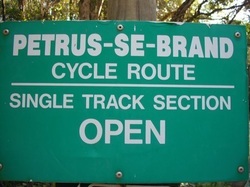 Diepwalle Forest station is the highest point on the route which means more downhills and thus better suited to the beginner mountain biker, the route markers are also more visible from this side. 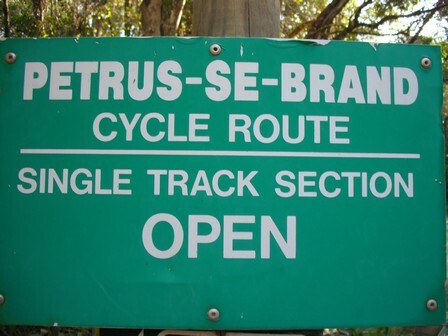 Starting from Diepwalle, go down the access road to the forests station back to the R339 (Knysna - Uniondale road), follow this road towards Knysna to a point were the trail forks off to the left pasta gate, +-2.8km from the start. For about a kilometer the trails follows the contoured bed of the old narrow-gauge forest railway that use to run here till you reach a T-junction and turn left. 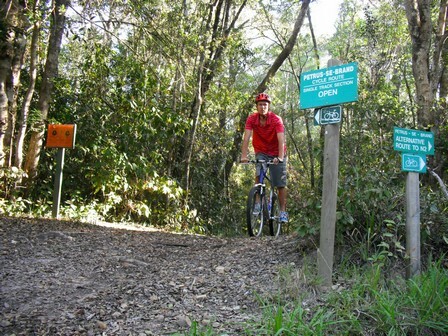 From here it is a +-2.5km downhill till you reach the Petrus-se-brand river (a small stream). From here starts an easy uphill to were one momentarily leaves the forest momentarily at a place called 'Kleineiland'. From here another decent into the Kleineiland river valley and then across a low-water bridge over the Kleineiland river, the lowest point on the route. Upstream from this bridge there ae some good swimming holes for a refreshing dip. From here starts quite a steep climb, rising 190m in 4km. At +-17.6km the trail T-in with the Fisantehoek road (public road), turn right here. 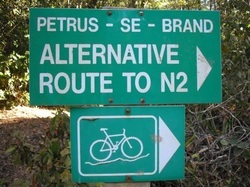 You can follow this road all the way to the N2 between Knysna and Garden of Eden (turn left to Garden of Eden). Alternatively, +-1.2km after reaching the T-junction, there forks a path off tho the left, this about 3.4km of mostly single track and is the most exhilarating part of the course. This also comes out on the N2 between Knysna and Garden of Eden(turn left to Garden of Eden). Permit & Costs: Permits available from Thesen Island Office or the Diepwalle Forestry Station. Directions to Diepwalle: From Knysna take the N2 towards Plettenberg Bay. and follow this road for 15.5km. Take the Diepwalle turnoff to the right. 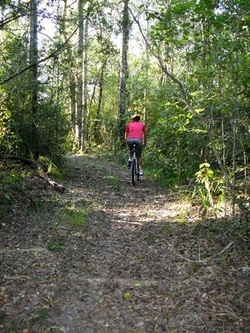 Continue for 1km and stop at Diepwalle Forestry Station. 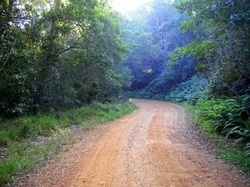 Garden of Eden is right next to the N2, 15km from Knysna towards Plettenberg Bay.